Continuing their events at GLI.TC/H in Chicago and Amsterdam GLTI.CH Karaoke will be presenting their work, followed by a live performance! Our aim is simple: to bring together people & collaborate on Karaoke duets. This desire, of course, is not innovative in itself; karaoke is one of the world’s favorite pastimes. Where GLTI.CH is different is its scope of our ‘bringing together’. So far, we have hooked up London with Kumamoto City, Japan & Seoul, South Korea. As a project that seeks to set up unnecessarily-elaborate portals of amateur singing, GLTI.CH Karaoke posits that there is discernible value & joy in 1) the collective stumbling & frustrations met in the face of tech limits, language barriers & time zone differences 2) oblique experimentation & 3) embracing & folding in “errors” in future iterations versus seeking to “overcome” or eradicate them. 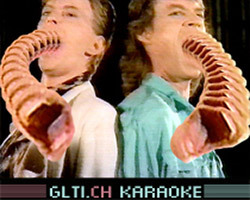 GLTI.CH Karaoke is not a solitary affair. At its simplest each event is the manifestation of sophisticated levels of collaboration & coordination between GLTI.CH & the attendees of each event, as well as the development teams of Livestream, Google+ & divX, & the individuals who selflessly hash together & upload karaoke videos to YouTube. Using the universal grammar of karaoke we posit the glitch as a site of artistic autonomy. Caught between a glide and a slipÊGLTI.CHÊKaraoke exposes the course of accidents, temporary lyrical disjoints and technical out-of-syncs. It’s not a hack or some fancy programming. It’s taking the frontend of things and trying to make something else. We’re Kyoung Kim and Daniel Rourke: writers, artists, researchers, wannabe hackers, amateur programmers at best. We kludge people together, breaching hopeless distances with cultural and technical make-dos. We cajole technology like 3-year olds with legos. WeÕve made the mishmashed world ofÊGLTI.CHÊKaraoke through play. And we hope youÕll sing with us.